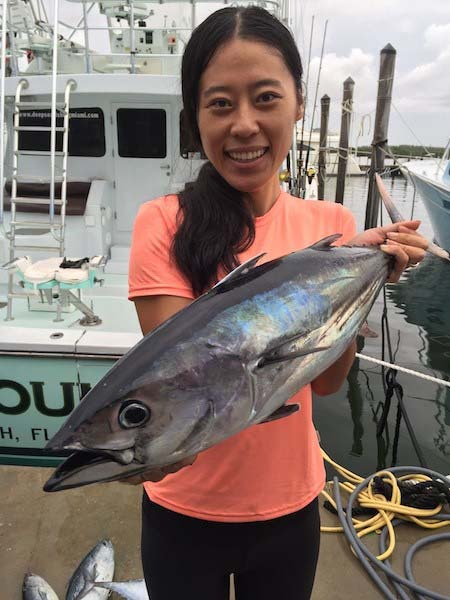 Miami Tuna Fishing during the summer months means catching football sized Blackfin Tuna. We find these tunas on the edge of the reef. Although if you venture off shore you may run into a lesser known tuna. The Skipjack Tuna is a remarkable purple colored bullet. The Skipjack is a smaller tuna averaging about 6 pounds, but found up to about 30 pounds. This small tuna is a tough fighter capable of long runs and big head shakes. Everyone catches a fish! 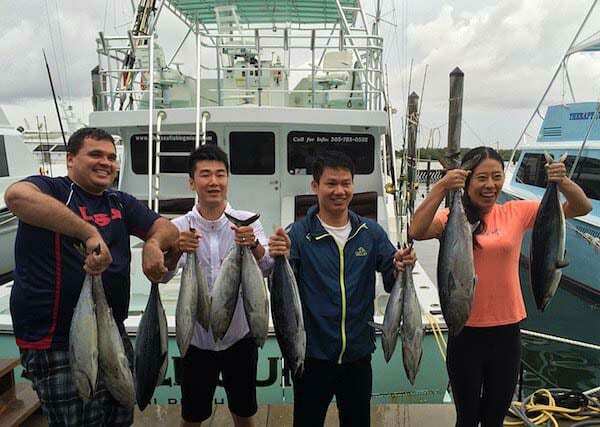 We find great success Miami tuna fishing by scaling back our tackle. Dropping our leader size to 30lb to 50lb. Switching from nylon leader to fluorocarbon leaders. We will also use small lures and feathers to “match the hatch” or imitate the small bait fish they are feeding on. Dropping the hook size to match the bait or lure. We have used hooks as small as 1/0 to 3/0. Therefore dropping your baits back farther from the boat will also help to get more strikes from Skipjack Tunas.